The report card lets you take a close look at each retailer and see why they received that grade. Starting with the good news, you can take a look at the six retailers who scored a B+ or higher and see the steps that they’re taking to protect consumer health: Apple, Walmart, CVS, IKEA, Whole Foods, and Target. If you shop at any of these retailers, you can reach out to them and thank them for taking positive steps to reduce our exposure to toxic chemicals. Unfortunately, those companies are outliers, and the majority of companies that were scored did much worse – the average grade was a D+. Nine companies, including Sally Beauty, Office Depot, Dollar General and Babies “R” Us, are lagging behind with F’s. There’s still a lot of work to do! Take action today to tell the CEOs of these nine companies that an “F” is not acceptable. 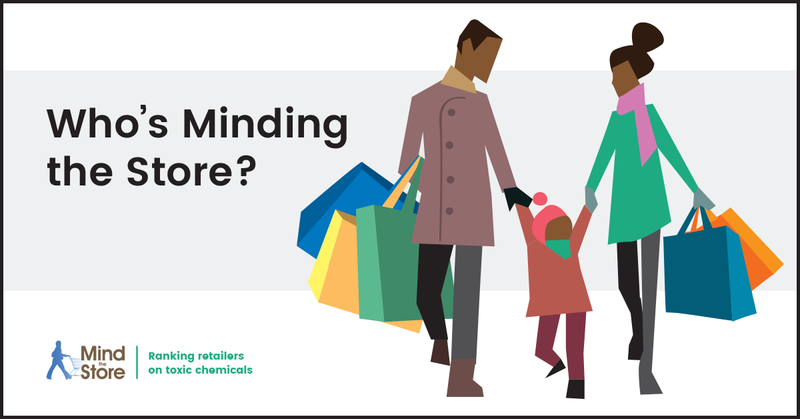 We need major retailers to step up and tackle toxic chemicals. Cancer cases and infertility rates are soaring—and scientists agree that exposure to toxic chemicals from various sources can contribute. Plus, chemical industry insiders are running the EPA’s chemical safety office and they aren’t doing enough to regulate potentially dangerous chemicals. We’re calling on the stores where we shop to take the lead on making sure the products they sell us are safe. And our efforts are working! Because of action from consumers like you, this year companies like Target, Walmart, CVS Health, The Home Depot and Costco have announced progress tackling toxic chemicals. This week, Clean Water Action members, volunteers, and staff, along with coalition partners will be doing a series of actions to urge these failing companies to take action and protect our health. Coalition for a Safe and Healthy Connecticut will be visiting Costco, Babies “R” Us, CVS and Trader Joe's locations in Connecticut to review the scoring and grades with store managers. "As a nurse and mother of two young children, I was very disturbed but not surprised to see the "F" grade that Babies R Us received. It shouldn't be so hard to find baby products that don't contain toxic chemicals,” stated Hacah Boros. In Massachusetts, Clean Water Action and allies are targeting the TJX Company by visiting six stores. The TJX Company owns and operates over 3,500 T.J. Maxx, Marshalls, Homegoods and Sierra Trading Post stores in nine different countries on three continents. They are the leading off-price retailer of apparel and home fashions in the U.S. and worldwide, and they’re headquartered in Framingham, Massachusetts. Another retailer receiving an “F” score is Sally Beauty Supply and an action was held at one of the forty-three Sally Beauty locations in Minnesota. Members and supporters of the Healthy Legacy Coalition, which Clean Water Action co-leads, held signs outside the Roseville location before heading inside and delivering a letter to the store manager. The company received an “F” score for failing to have safer chemicals policies that ensure the chemical safety of their products and supply chains. In Rhode Island, where CVS is headquartered, Clean Water Action will be leading a delegation to thank CVS for their continued improvements to their corporate chemical policy. In California, campaigners from Clean Water Action, Center For Environmental Health and other organizations will be picketing outside Safeway’s headquarters in Pleasanton. Safeway earned a C grade, but we are urging them to continue making improvements. You can help make sure the progress continues. Act now to send a message to CEOs at the nine companies who are lagging behind on protecting our health!